Tottenham manager Mauricio Pochettino says he very happy to be with Spurs. He said that after stating that if Real Madrid came calling he would “have to listen”. Pochettino said that in Spanish at the launch of his new book. 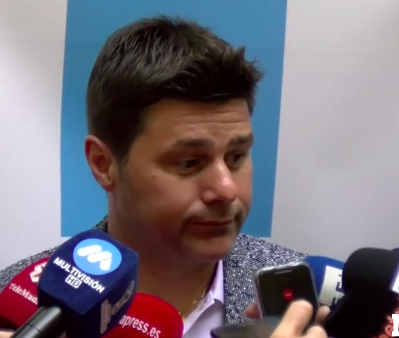 Hours after Zinedine Zidane quits as boss at the Bernabeu, Pochettino in Spain talking about Real Madrid. What are the odds? And of that decision to sign a new five-year deal to stay at Spurs? Says Pochettinho: “We all have dreams, but I’ve renewed ten days ago and I’m happy in London.” Not exactly settling minds at Spurs, is he? The Spanish paper recalls that when Gareth Bale and Luka Modric both made the move from Spurs to Real Madrid talks dragged on until very late August as Spurs chairman Daniel Levy made the Spaniards sweat. But doing that again could leave Spurs without a manager or with an unhappy one. “Daniel bites,” said Pochettinho of the chairman’s negotiating style. Is that come kind of heads up to Madrid? Is he “ready for a challenge like Real Madrid”. Yes? No? “Right now I am ready to go to lunch. I’m looking forward to going back to London,” Pochettino replies.